Schoolgirl fantasies are the stuff of legends. A young, attractive student and worldly, suave, slightly older professor get together, and there’s only one way to describe it: Naughty. But is that really the way it happens? We polled over 2,000 current and former students to find out the dirty details. How many have had inappropriate sexual relations with their professors, and what were the reasons for doing so? We even asked if they would pursue a romantic relationship if no one would find out about it. Curious to see this taboo go from classroom to bedroom? Keep on reading. Office hours are just starting. Of the 2,000 people we polled, over 14 percent boldly – and under the curtain of anonymity – said they had had inappropriate relations with a professor. While it might not be the majority, that’s still 14 percent of students (and former students) who have been sexual with a professor, TA, or member of the academic staff. Respondents also told us that 45.5 percent of those entanglements were kicked off by the teacher or faculty member. Apparently, power and knowledge can be quite the academic aphrodisiac. In the typical schoolgirl fantasy trope, the perception or belief is that the student is usually (you guessed it) a girl fawning over her professor. In reality, more than 57 percent of students who admitted their sexual exploits with teachers were male. So what’s the motivation behind sleeping with a professor? 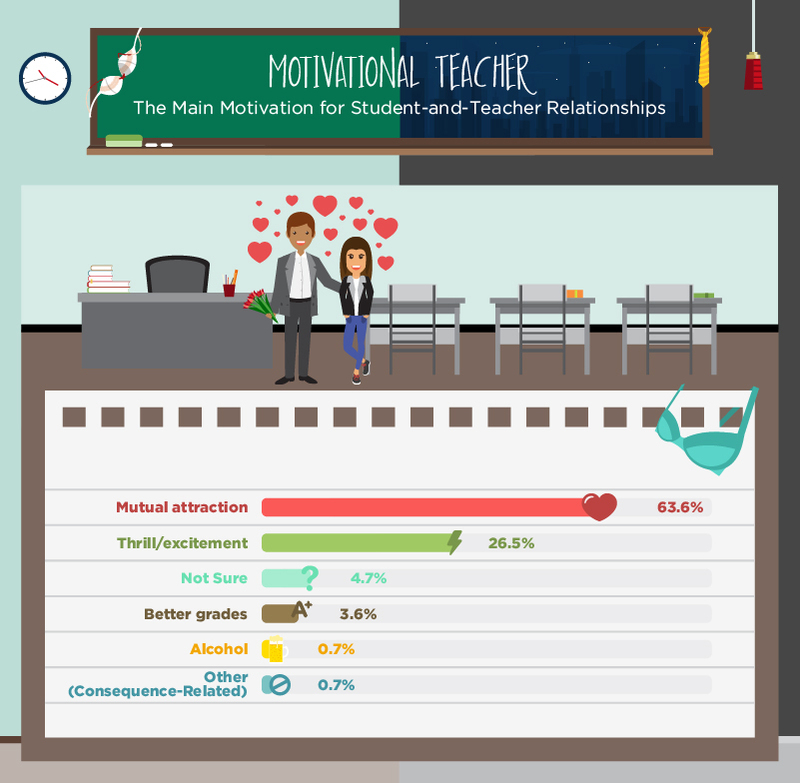 Nearly 64 percent of students told us it was mutual attraction – teachers and students feeling hot for each other. And really, isn’t that the motivation for any good sexual relationship, even if it isn’t in the lesson plan? More than 26 percent told us that it was the thrill and excitement that got them going. Maybe it was the danger of getting caught or the forbidden flirtations after class? Most students said that they had only slept with their professor between one and three times, so it seems that the desire passes with the thrill of the moment – or when the semester is over. Fewer than 4 percent of respondents said they did it to get better grades (whether you happen to get them anyway is irrelevant, right? ), while almost 5 percent weren’t even sure of the reasoning behind their risky tryst. Sleeping with a professor takes a lot of guts (and libido), and only 14 percent of respondents told us that they had crossed that line. Still, more than half of the students surveyed were willing to admit that they had at least thought about hooking up with a teacher. Of those who said they had considered it, more than a third said they would have done it if they knew they wouldn’t get caught. The morality of the situation is less concerning to some than the stigma of being found out, it seems. Nearly 15 percent admitted that they weren’t sure they’d do it even if they wouldn’t get caught. Still, a fair portion of respondents said that they hadn’t fantasized about it at all. Whether they see it as being indecent or they just haven’t found the right teacher remains to be seen. Nearly one out of every five students we surveyed told us their tryst was with a professor who taught sciences. Considering that science is a rational subject largely void of emotion or gray areas, physical attraction between two people may be less likely to be scrutinized under the microscope of morality. Person A finds person B to be sexually appealing – thus, they engage in sexual activity. Easy as that. English and literature, as well as liberal arts and social sciences, were also fairly popular subjects for students to find themselves involved with a professor. Perhaps the existential crisis of the human condition compels us to give in to lust, despite evidence that we should avoid it. Or maybe it just comes from reading and analyzing far too many Jane Austen novels about forbidden romance. Should a student who slept with their professor feel ashamed? Who or what gives credence to the virtue of a relationship? Over 80 percent of respondents said they didn’t regret becoming involved with a professor, nor did they feel embarrassed (though they largely didn’t tell anyone about it). Breaking down the barriers of perception versus reality in sexual relationships among professors and students, we found that this fantasy might not be as risqué as originally thought. Many of those we surveyed told us that these sexual liaisons occurred among adults who were roughly the same age and that they were more likely to be one-off encounters rather than prolonged affairs. And most did not regret the decision. Still, that doesn’t mean that some of these flings don’t have negative emotional consequences (or even professional ones). But can’t that be said for just about any type of relationship? For more on this or any other collegiate subjects, visit CollegeStats.org. We provide the most comprehensive college and university data available from the most diverse sources and bring you the best and latest college news.